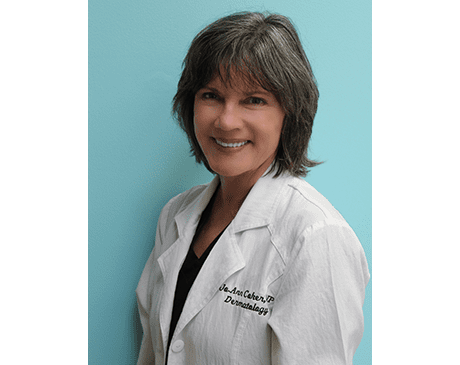 Jo Ann Coker, NP-C, is an Advanced Practice Nurse Practitioner in medical, surgical, and cosmetic dermatology practicing in San Juan Capistrano, California. She has been part of HK Dermatology since 1988 and attained her RN in 1995. While continuing her education, she achieved ever-increasing knowledge and hands-on experience in dermatology and received her Masters of Science in Nursing in 2008. Jo Ann is board certified with the American Academy of Nurse Practitioners. Jo Ann‘s priority is in detecting all types of skin cancers by conducting a complete and thorough skin exam. She is experienced in a full range of dermatology from acne, skin care and rashes to biopsies and skin cancer treatments. She also has extensive skill in providing some of the most advanced cosmetic procedures while retaining a more natural look utilizing a combination of injectables, microneedling, and lasers. Jo Ann currently lives in the Murrieta/Temecula area, however, she continues to commute to our office on a consistent but somewhat limited basis. We at HK Dermatology admire her tenacity and dedication to patients and our practice and we are so pleased to continue to have her as part of our team.